Throughout history the killing of animals for entertainment and celebration has been accepted as normal. In the reign of Queen Elizabeth I (1558-1603) it is recorded that the Spanish ambassador, having attended a celebration in London, had said how cruel the English were in the way they tortured bulls. At that time in Spain bullfighting was carried out on horseback, to celebrate notable occasions: royal weddings, military victories and religious solemnities. It was not until the 18th century that bullfighting in its present form became popular. Since then there has been a spread of bullfighting, through the influence of Spain, over its borders and also in the Americas. 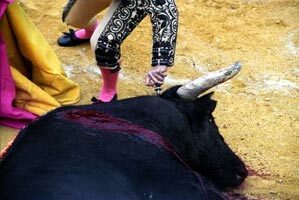 The countries in which bullfighting takes place are: Spain, Portugal, France, Mexico, Colombia, Venezuela, Peru and Ecuador. There have been a number of attempts to introduce bullfighting into other countries around the world, such as Russia, Poland, China, Egypt, Macao and Kazakhstan. Some of these countries have tried bullfighting for one year, but found that the trouble they had from their own and outside groups, plus the lack general of interest, made it not worth the hassle for them to continue. 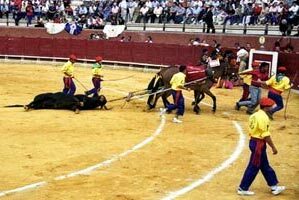 FAACE has been involved in many of the attempts to stop the spread of bullfighting. 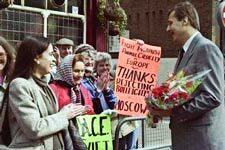 FAACE was part of a Euro capital city demonstration in London against a plan to have bullfighting in Moscow.Whilst travelling to London FAACE learned that the Russian government had cancelled the bullfight, stating, “We have enough criminals of our own without importing more!” Instead of demonstrating FAACE was able to give thanks to a spokesman for Russian embassy in London (left). When an attempt was made to take bullfighting to Cairo, FAACE intervened behind the scenes and a religious Fatwa was taken out against the event. The bullring had been built and tickets were sold, but it had to be abandoned. A spokesman told us “The bullfighters might as well pack their bags now”. In 1996 Vicki Moore went to Macao (China). This was to be the second year a bullfight was to be staged there. When asked the year before she was extremely ill from the goring she had received by a bull in Spain and could not go. When in Macao she created very bad press for the bullfighters. BSE was prevalent at the time and she pointed out the problems they might have with eating what had been advertised as" the wonderful meat of the dead bulls". A number of local Macao animal rights people disrupted a parade through the streets by the bullfighters. The organisers decided that there would be no more bullfights. 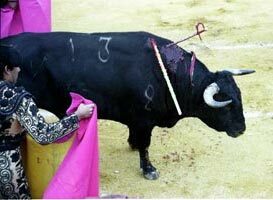 On 28th July 2010 a bill banning bullfighting was passed in Catalonia. We were delighted when the Catalan parliament voted by a good majority to ban bullfighting in the Catalan region of Spain as of 1st January 2012. It was a decisive vote: 68 for the ban, 55 against it and nine abstentions. In 1988 Vicki and Tony Moore persuaded mayor Telm Zaragosa to declare Tossa de Mar, in Catalonia to become the first anti bullfighting town in Spain. As time went by many more towns declared themselves anti bullfight and this culminated in the total ban. It is wonderful to know that from this small beginning such a great advance has been made. There is a saying that where Barcelona leads Madrid follows. We are not holding our breath, but we can hope. FAACE will continue to work for the end of bullfighting throughout the world.